I love music – lots of different kinds of music. One thing that’s been on my to-do list for absolutely ages was to go see and hear an organ being played. The organs here – they’re MASSIVE. They’re built into the buildings. I’ve never seen anything like them. We must have some like them in America, somewhere, because some of the organists are American, but we don’t have them in little ol Bossier City, even though it’s the heart of the Bible belt. 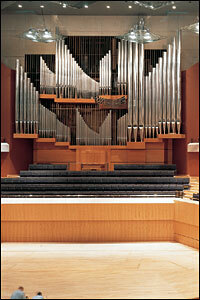 The pipes are stunning enough to look at – always such a centerpiece to any building they’re in. These are in the Bridgewater Hall – Manchester’s premier concert venue for acoustics. There are 5,500 pipes there. 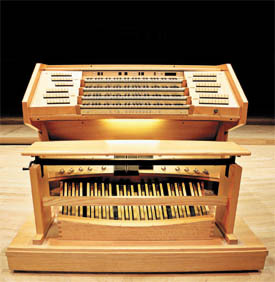 However, anytime I see the console (controller) for the organ, I just stand there, mouth agape, wondering how on Earth one person manages to control all that. Finally, I found a concert I could get to – Bridgewater Hall put on a series, and I could get to one, called Dancing Feet. Last week, I went. Boy, what an appropriate title! His feet did move across the foot keyboard so much – and his hands across the four other keyboards – and THE SOUND coming out of that thing was unreal; it was like an entire orchestra!!! So, while I’m figuring out what I’d like to do when I visit London next week, I came across an organ recital. Oh, right. The timing was a bit tight for my garden party, but – not knowing anything about where things are (after all, that’s what maps are for) – I was vaguely hopeful that perhaps the chapel was perhaps very near Buckingham Palace, so I could do both. 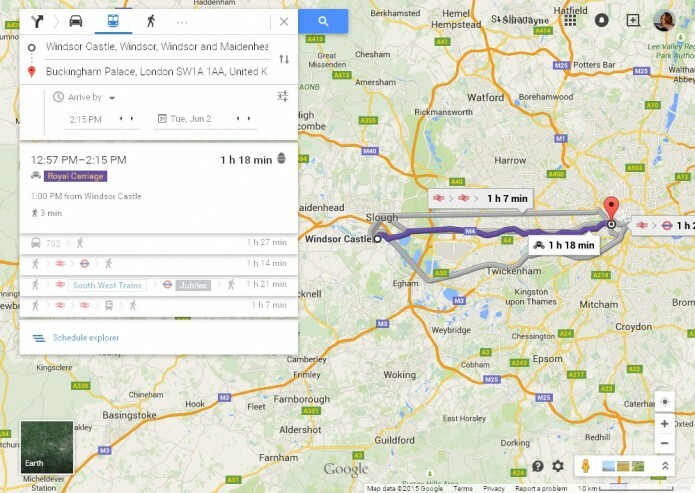 St George’s Chapel is the chapel attached to Windsor Castle, so I duly went to Google Maps and typed in directions from Windsor Castle to Buckingham Castle, as you do. I clicked on the public transport option, of course. 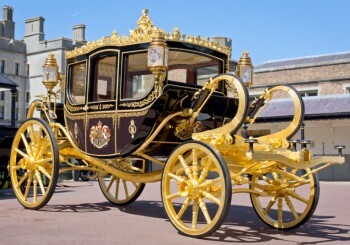 And what option should appear, but “Take the Royal Carriage!” As you do! The hat might pass inspection, but I’m less sure about my dress, up against that contraption of gold leaf! We went on vacation – twice in two years, I know, we’re such slackers. We were in Germany for ten days. More on that in future posts. We got home around midnight Sunday night (the 24th); our vacation extended into Monday since that was a bank holiday. We picked up a few things here and there as the week progressed, besieged with life, as happens. I finally did a proper shopping trip on Friday. As usual, it took far longer than I expected it to – I always wonder how that happens. Hey ho. We received our supermarket delivery the other night (I love the fact that supermarkets here deliver; I generally get about one delivery a month to save lugging quite so much – toilet paper, etc is bulky). I don’t generally get produce [fruit & vegetables] in these deliveries, generally preferring my local greengrocer’s, but the watercress was on a particularly good sale, so I got some of that. Ah, we’re supposed to decant the watercress. *giggle* Decant is one of my favorite silly words, you see. 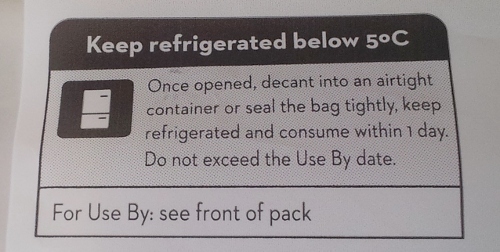 It only means put it in another container, but it sounds so fancy! Posh, even. In this context, slightly pompous, actually, aided and abetted by the “Do not exceed the Use By Date.” Or else it will EXPLODE, clearly. Not to worry – after removing it from this wrapper, we have, indeed, decanted the watercress. It’s not languishing about uncontained! We don’t have a television (for many different reasons), but we do enjoy watching certain shows very occassionally. Columbo is one of these, and we watched an episode recently. One thing we noticed early on about Columbo is that there’s an overwhelming prevalence of husbands and wives killing each other – so now we have a running joke, after watching an episode, to promise to each other we won’t kill one another. As you do. One of the methods used in this most recent episode was poison, so I made Chris promise to not poison me. He duly did. Later on, as you can expect, he said he can’t cook or help cook anymore, so that he doesn’t accidentally poison me. Mmmhmmm. “So you’re just going to revert to your college ways?” he asked. “I’ll have to start buying ramen again, and making spaghettios,” I continued. “There’s nothing wrong with living off sandwiches! I know, I’ve done it!” I cheerily objected. “HOW HAVE YOU SURVIVED?! ?” he demanded. I’m afraid I must dash now – I’m hungry, so I think I’ll go fix myself a sandwich!